Oak Tree School is a specialist provision positioned near the city of Truro in Cornwall. The school provides full-time specialist co-education for up to 45 children and young people aged 7 to 16 who experience social, emotional, mental health, communication difficulties and associated challenging behaviours. These children and young people often cannot cope, function or achieve within a mainstream environment. The aim is to provide a structured, nurturing approach, with pupils accessing a broad, balanced and engaging curriculum to meet their significant needs. Oak Tree School is committed to raising achievement and enabling all pupils to recognise and fulfil their potential, and support them through a personalised, engaging and relevant curriculum. We will address a complex range of barriers to learning including conditions such as attention deficit hyperactivity disorder, oppositional defiance disorder and a range of autistic spectrum disorders. Our priorities are to develop and improve the core knowledge and skills required to make a manageable and successful transition to work, college and adult life. We will provide a structured and supportive environment where our C&YP feel safe enough to take responsibility for their actions. Pupils will be encouraged and taught to make positive choices and decisions and therefore present and display socially acceptable behaviours. Reducing/removing their barriers to learning. Developing their ability to communicate and interact with others appropriately. Developing their ability to be flexible and adapt to change. Encouraging them to positively manage their behaviours and difficulties. Developing their self-esteem, independence and ability to have positive and constructive relationships with others. Providing a broad, balanced and relevant curriculum that meets each of their needs and ensures an appropriate balance between challenge and support. Providing a range of therapies to help them overcome their difficulties and to reach their full potential. Keeping them safe and protecting their welfare, and through the broader curriculum developing their ability to keep themselves safe. Encouraging them to explore how they think and how they behave through a variety of therapeutic interventions, psychological, mental health, SALT, OT, CBT, person centred approaches and art and play therapy. committing to the principle they all, regardless of their ability, race, gender, cultural and religious background or immigration status have the right and entitlement to the highest quality of education we can provide. Working in partnership with their parents/carers and other professionals as an effective multi-disciplinary team. Mike has over 19 years of experience in teaching, initially qualifying as a secondary science teacher after studying his PGCE. 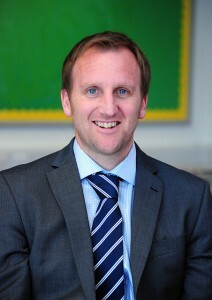 He spent seven years as a Deputy Headteacher at Caradon AP Academy in Liskeard before becoming Headteacher at Oak Tree School in January 2014.